Botulism (from the Latin word botulus, meaning sausage) is a rare, but serious paralytic illness caused by a nerve toxin, botulin, that is produced by the bacterium Clostridium botulinum. Botulinic toxin is one of the most powerful known, with a lethal dose of a microgram. It acts by blocking nerve function and leads to respiratory and musculoskeletal paralysis. Since diet is the principle method of contracting botulism, this illness is largely preventable by proper personal and social responsibility regarding food preparation, both for the public and for personal consumption, including care in home-canning of foods. Human creativity has found good purposes for the toxin, including the production of Botox for cosmetic purposes and use of the toxin in such medical purposes as treating severe facial pain. On the other hand, the toxin has generated interest as a potential deadly agent for biological warfare. Infant botulism is caused by consuming the spores of the botulinum bacteria, which then grow in the intestines and release toxin. Infants less than 12 months of age are susceptible to this form, since the adult digestive system is not amenable to survival of the spores. Wound botulism is caused by toxin produced from a wound infected with Clostridium botulinum. This is the rarest type of botulism. All forms of botulism can be fatal and are considered medical emergencies. Foodborne botulism can be especially dangerous as a public health problem because many people can be poisoned from a single contaminated food source. In the United States, an average of 110 cases of botulism are reported each year. Of these, approximately 25 percent are foodborne, 72 percent are infant botulism, and 3 percent are wound botulism. Outbreaks of foodborne botulism involving two or more persons occur during most years and usually are caused by eating contaminated home-canned foods. The number of cases of foodborne and infant botulism has changed little in recent years, but wound botulism has increased because of the use of the illegal drug, black tar heroin (Passaro et al. 1998). Clostridium botulinum is the bacterium that produces the toxin botulin, the causative agent in botulism (Ryan and Ray 2004). It is included in the genus Clostridium, a major group of Gram-positive forms. C. botulinum was first recognized and isolated in 1896, by Emile van Ermengem and is commonly found in soil. These rod-shaped organisms grow best in low-oxygen conditions. They form spores that allow them to survive in a dormant state until exposed to conditions that can support their growth (Martinko 2005). Each of the seven subtypes of C. botulinum produces a different botulin toxin (Wells and Wilkins 1996). These are labeled with letters from A to G. Types C and D are not human pathogens. A "mouse protection" test determines the type of C. botulinum present using monoclonal antibodies. In the United States, outbreaks are primarily due to types A or B, which are found in soil, or type E, which is found in fish. Optimum temperature for types A and B is 35-40° C. Minimum pH is 4.6. It takes 25 min at 100°C to kill these types. Optimum temperature for type E is 18-25°C. Minimum pH is 5.0. It takes about 0.1 minute at 100°C to kill type E C. botulinum. Clostridium botulinum is also used to prepare Botox, which is used to selectively paralyze muscles to temporarily relieve wrinkles. It has other medical purposes, such as treating severe facial pain, caused by ailments like trigeminal neuralgia. Botulin toxin produced by Clostridium botulinum is often believed to be a potential bioweapon. As it is so potent that it takes less than 1 microgram to kill a person, a drop could kill 100,000 people, and 1 pound of it can kill the entire human population. Growth of the bacterium can be prevented by high acidity, high ratio of dissolved sugar, high levels of oxygen, or very low levels of moisture. For example, in a low acid, canned vegetables such as green beans that are not heated hot enough to kill the spores (ie. a pressurized environment) may provide an oxygen-free medium for the spores to grow and produce the toxin. On the other hand, tomatoes or tomato sauce are sufficiently acidic to prevent growth; even if the spores are present, they pose no danger to the consumer. Honey, corn syrup, and other sweeteners may contain spores but the spores cannot grow in a highly concentrated sugar solution; however, when a sweetener is diluted in the low oxygen, low acid digestive system of an infant, the spores can grow and produce toxin. As soon as infants begin eating solid food, the digestive juices become too acidic for the bacterium to grow. Classic symptoms of food-borne botulism occur 12–36 hours after consuming the botulinum toxin, although they can occur as early as 6 hours or as late as 10 days. Wound botulism has a longer incubation period, usually 4–14 days. Common symptoms of either form usually include dry mouth, difficulty swallowing, slurred speech, drooping eyelids, muscle weakness, double and/or blurred vision, vomiting, and sometimes diarrhea. These symptoms may progress to cause paralytic ileus (limited or absent intestinal passage) with severe constipation, and eventually, body paralysis. The respiratory muscles are affected as well, which may cause death due to respiratory failure. These are all symptoms of the muscle paralysis caused by the bacterial toxin. In all cases, illness is caused by the toxin made by C. botulinum, not by the bacterium itself. The pattern of damage occurs because the toxin affects nerves that are firing more often. Infant botulism (first recognized in 1976) is the most common form of the ailment in the United States, but is rarely diagnosed in other countries. It affects about 100 infants per year in the United States, with the majority in the state of California (50–60 percent). Infants less than 12 months of age are susceptible, with 95 percent of cases occurring between the ages of 3 weeks and 6 months of age at presentation. The mode of action of this form is through colonization by germinating spores in the gut of an infant. The first symptom is usually constipation, followed by generalized weakness, loss of head control, and difficulty feeding. Because of these symptoms, infant botulism is sometimes referred to as "floppy baby syndrome." Like the other forms of botulism, the symptoms are caused by the absorption of botulinum toxin, and typically progress to a symmetric descending, flaccid paralysis. Death is the eventual outcome unless the infant receives artificial ventilation. Honey, corn syrup, and other sweeteners are potentially dangerous for infants. This is partly because the digestive juices of an infant are less acidic than older children and adults, and may be less likely to destroy ingested spores. In addition, young infants do not yet have sufficient numbers of resident microbiota in their intestines to competitively exclude C. botulinum. Unopposed in the small intestine, the warm body temperature combined with an anaerobic environment creates a medium for botulinum spores to germinate, divide and produce toxin. Thus, C. botulinum is able to colonize the gut of an infant with relative ease, whereas older children and adults are not typically susceptible to ingested spores. C. botulinum spores are widely present in the environment, including honey. For this reason, it is advised that neither honey, nor any other sweetener, be given to children until after 12 months. Nevertheless, the majority of infants with botulism have no history of ingestion of honey, and the exact source of the offending spores is unclear about 85 percent of the time. Spores present in the soil are a leading candidate for most cases, and often a history of construction near the home of an affected infant may be found. Botulinum toxin blocks the release of acetylcholine from nerve endings, thus arresting their function. The C. botulinum bacterium does not produce toxin in an aerobic environment, and the toxin is unstable to heating, so poisoning generally occurs from the use of improperly bottled or canned foods. Typical instances of botulism would be home-bottled preserves used in salads. An unusual example of botulism occurred in Britain in the exceptionally hot, dry summer of 1976, when river levels dropped so low in some areas that feeding swans accidentally ingested material from anaerobic layers in a river (normally out of their reach), and were struck by botulism symptoms. Cases of inadvertent botulism have occurred due to overdose or accidental intravenous injection of Botox, which is a commercially producted from botulinum toxin. Physicians may consider the diagnosis if the patient's history and physical examination suggest botulism. However, these clues are often not enough to allow a diagnosis of botulism. Other diseases, such as Guillain-Barré syndrome, stroke, and myasthenia gravis, can appear similar to botulism, and special tests may be needed to exclude these other conditions. Tests used in diagnosing botulism may include a brain scan, cerebrospinal fluid examination, nerve conduction test (electromyography, or EMG), and an Edrophonium Chloride (Tensilon) test for myasthenia gravis. The most direct way to confirm the diagnosis is to demonstrate the botulinum toxin in the patient's serum or stool by injecting serum or stool into mice and looking for signs of botulism that can be blocked by specific antisera. The respiratory failure and paralysis that occur with severe botulism may require a patient to be on a breathing machine for weeks, plus intensive medical and nursing care. After several weeks, the paralysis slowly improves. If diagnosed early, foodborne and wound botulism can be treated by inducing passive immunity with a horse-derived antitoxin, which blocks the action of toxin circulating in the blood (Shapiro et al. 1998). This can prevent patients from worsening, but recovery still takes many weeks. Physicians may try to remove contaminated food still in the gut by inducing vomiting or by using enemas. Wounds should be treated, usually surgically, to remove the source of the toxin-producing bacteria. Good supportive care in a hospital is the mainstay of therapy for all forms of botulism. Besides supportive care, infant botulism can be treated with human botulism immune globulin (BabyBIG), when available. Supply is extremely limited. This dramatically decreases the length of illness for most infants. Paradoxically, antibiotics (especially aminoglycosides or clindamycin) may cause dramatic acceleration of paralysis as the affected bacteria release toxin. Visual stimulation should be performed during the time the infant is paralyzed as well, in order to promote the normal development of visual pathways in the brain during this critical developmental period. Furthermore, each case of food-borne botulism is a potential public health emergency in that it is necessary to identify the source of the outbreak and ensure that all persons who have been exposed to the toxin have been identified, and that no contaminated food remains. 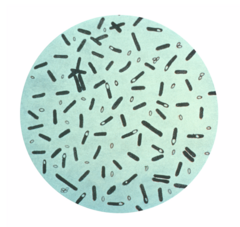 There are two primary botulinum antitoxins available for treatment of wound and foodborne botulism. Trivalent (A,B,E) Botulinum Antitoxin is derived from equine sources utilizing whole antibodies (Fab & Fc portions). This antitoxin is available from the local health department via the Centers for Disease Control (CDC). The second antitoxin is heptavalent (A,B,C,D,E,F,G) Botulinum Antitoxin, which is derived from "despeciated" equine IgG antibodies that have had the Fc portion cleaved off leaving the F(ab')2 portions. This is a less immunogenic antitoxin that is effective against all known strains of botulism where not contraindicated. This is available from the U.S. Army. On June 1, 2006, the U.S. Department of Health and Human Services awarded a $363 million contract with Cangene Corporation for 200,000 doses of Heptavalent Botulinum Antitoxin over five years for delivery into the Strategic National Stockpile beginning in 2007 (Lam and Borio 2006). Botulism can result in death due to respiratory failure. However, in the past 50 years, the proportion of patients with botulism who die has fallen from about 50 percent to 8 percent due to improved supportive care. A patient with severe botulism may require a breathing machine (ventilator) as well as intensive medical and nursing care for several months. Patients who survive an episode of botulism poisoning may have fatigue and shortness of breath for years and long-term therapy may be needed to aid their recovery. Infant botulism has no long-term side effects, but can be complicated by nosocomial adverse events (secondary infections from a hospital setting). The case fatality rate is less than 1 percent for hospitalized infants with botulism. While commercially canned goods are required to undergo a "botulinum cook" (121°C for 3 minutes) and so rarely cause botulism, there have been notable exceptions (such as the 1978 Alaskan salmon outbreak). Foodborne botulism has more frequently been from home-canned foods with low acid content, such as carrot juice, asparagus, green beans, beets, and corn. However, outbreaks of botulism have resulted from more unusual sources. In July, 2002, fourteen Alaskans ate muktuk (whale meat) from a beached whale, and eight of them developed symptoms of botulism, two of them requiring mechanical ventilation (CDC 2003). Other origins of infection include garlic or herbs stored covered in oil (CSUCE 1998), chili peppers (CDC 1985), improperly handled baked potatoes wrapped in aluminum foil (PMD 1998), and home-canned or fermented fish. Persons who do home canning should follow strict hygienic procedures to reduce contamination of foods. Oils infused with garlic or herbs should be refrigerated. Potatoes that have been baked while wrapped in aluminum foil should be kept hot until served or refrigerated (PMD 1998). Because the botulism toxin is destroyed by high temperatures, persons who eat home-canned foods should consider boiling the food for 10 minutes before eating it to ensure safety. Canned foods may also indicate botulism infestation by outward bulges in the can, which result from gas production (perhaps during bacterial growth) causing increased pressure inside the can. It would be safest to simply throw such cans away as the bacteria that grew could be a source of botulism. Honey and other sweeteners should not be fed to infants until their digestive systems have matured—typically this will be after weaning age (ie, 18 months+). Wound botulism can be prevented by promptly seeking medical care for infected wounds, and by avoiding punctures by unsterile implements such as needles used for street drug injections. Between 1910 and 1919, the death rate from botulism was 70 percent in the United States. Death rates from botulism dropped to 9 percent in the 1980s, and 2 percent in the early 1990s, mainly because of the development of artificial respirators. Up to 60 percent of botulism cases can be fatal if left untreated. The World Health Organization (WHO) reports that the current mortality rate is 5 percent (type B) to 10 percent (type A). Other sources report that, in the U.S., the overall mortality rate is about 7.5 percent, but the mortality rate among adults 60 years and older is 30 percent. The mortality rate for wound botulism is about 10 percent. The infant botulism mortality rate is about 1.3 percent. One study showed that approximately 5 percent of children whose death was attributed to Sudden Infant Death Syndrome had actually died of botulism. Centers for Disease Control (CDC). 2003. Outbreak of botulism type E associated with eating a beached whale—Western Alaska, July 2002. Morbidity and Mortality Weekly Report, January 17, 2003. Retrieved May 18, 2007. Centers for Disease Control (CDC). 1985. Update: International Outbreak of Restaurant-Associated Botulism—Vancouver, British Columbia, Canada. Morbidity and Mortality Weekly Report, October 18, 1985. Retrieved May 18, 2007. Colorado State University Cooperative Extension (CSUCE). 1998. Oil infusions and the risk of botulism. SafeFood News 2(4). Retrieved May 18, 2007. Evans, R. 1997. Clostridium botulinum in the food chain. Hygiene Review, The Society of Food Hygiene and Technology. Retrieved May 18, 2007. Lam, C., and L. Borio. 2006. HHS to acquire heptavalent botulinum antitoxin. metropolitan Medical Response System, Public Health News, Clinicians’ Biosecurity Network, August 3, 2006. Retrieved May 18, 2007. Passaro, D. J., S. B. Werner, J. McGee, W. R. Mac Kenzie, and D. J. Vugia. 1998. Wound botulism associated with black tar heroin among injecting drug users. JAMA 279: 859-63. Personal MD (PMD). 1998. Botulism linked to baked potatoes. Personal MD. Retrieved March 21, 2007. Shapiro, R. L., C. Hatheway, and D. L. Swerdlow. 1998. Botulism in the United States: A clinical and epidemiologic review. Annals of Internal Medicine 129(3): 221-228. Retrieved May 18, 2007. Botulism (Technical information from the Centers for Disease Control and Prevention). This page was last modified on 20 December 2016, at 15:34.